Cakes by Rubina is a small family owned business in the richly diverse Ann Arbor. Our vision is to create a “One of a Kind” enterprise of designing customized, eye-catching, moist, and sinfully scrumptious cakes for your personal, cultural, religious and any other occasion that calls for celebration. For us the individually conceived, planned and designed cake is not just a dessert but a statement of who you are and an expression of what you want to say to yourself and your friends, family and guests. Whether you're hosting a formal gathering or an intimate dinner with close friends, your special occasion calls for an exceptional cake. A cake from us will be remembered by you and your guests as the most memorable touch to your event. We don’t believe in “One Taste Suits All”. Having lived in Ann Arbor for the last ten years we admire the diversity of our community and richness of its academic, cultural and social life. We know that diversity means that people have different, special and unique tastes, which can only be gratified by giving full attention to the discerning demands of each customer. We have benefited from Ann Arbor’s richness tremendously and now we want to give something back to our adopted community. We have lived in three continents and having appreciative pallets for desserts have indulged in sampling and creating cakes practically all over the world. At Cakes by Rubina we believe that food should not only sustain the body, but also lift up the spirit. Hence we look forward at all times to offer you the finest in quality and aesthetic that will foster both. We have the expertise but more than that we are passionate about creating and designing cakes for your special occasions. We are confident you will cherish our contribution to your celebrations as one of the many delicious, indulgent and yes, even decadent, culinary experience. 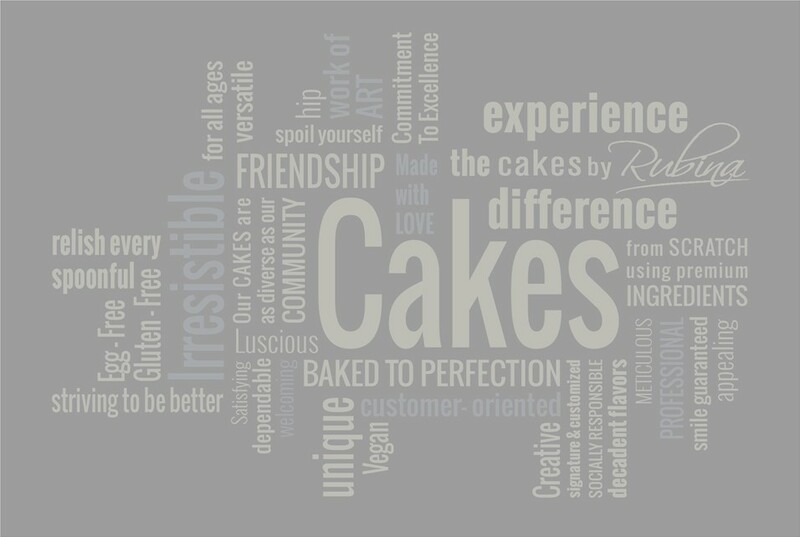 As we look forward, we are energized about the future of Cakes by Rubina. We are planning for constant growth, quality products, and pleased customers. We also keep looking back, to good quality simple ingredients, and to the recipes that ignited the taste buds of our families and yours!